Our review: Light golden yellow with an abundance of bubbles, this wine has aromas of peach and other tree fruit with distinct notes of nuts. Very light and initially slightly sweet on the palate, the fruit flavors emerge into the finish, which is on the dry side and a bit toasty. Taste profile from the winemaker: "Colour: brilliant yellow. Fragrance: fruit-like taste. Flavour: pleasant, sapid and properly sweet." 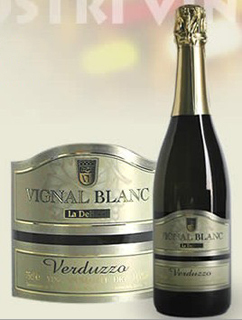 Winery website: Vini La Delizia.